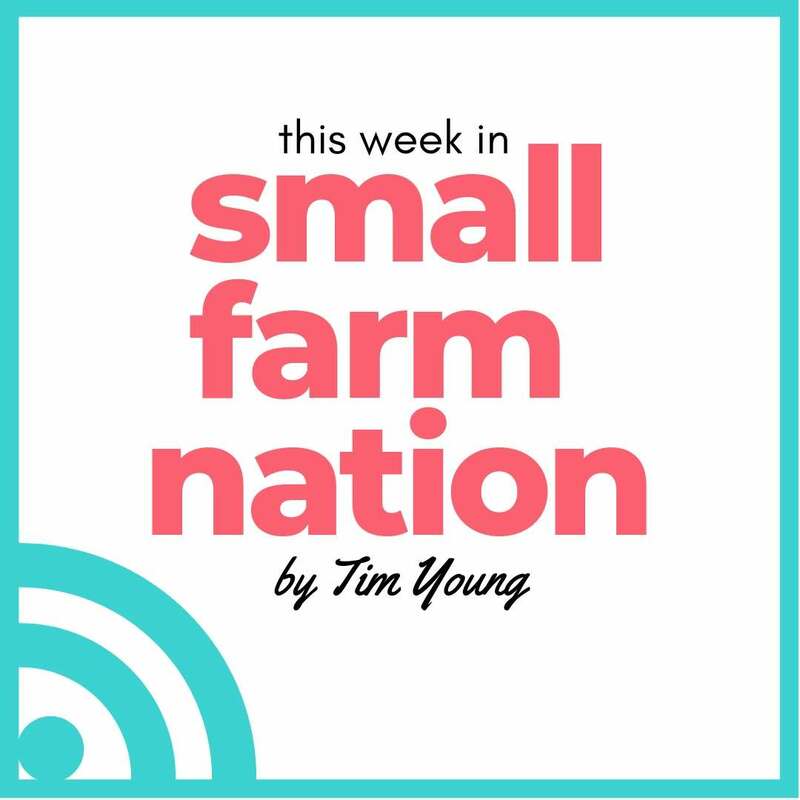 First up, this week’s podcast, which is titled, “Making it Easier to Buy Craft Meat With Crowd Cow.” I really enjoyed talking with Joe Heitzeberg, CEO of Crowd Cow, because I was curious about their business model and whether it’s an attractive alternative for consumers and farmers. 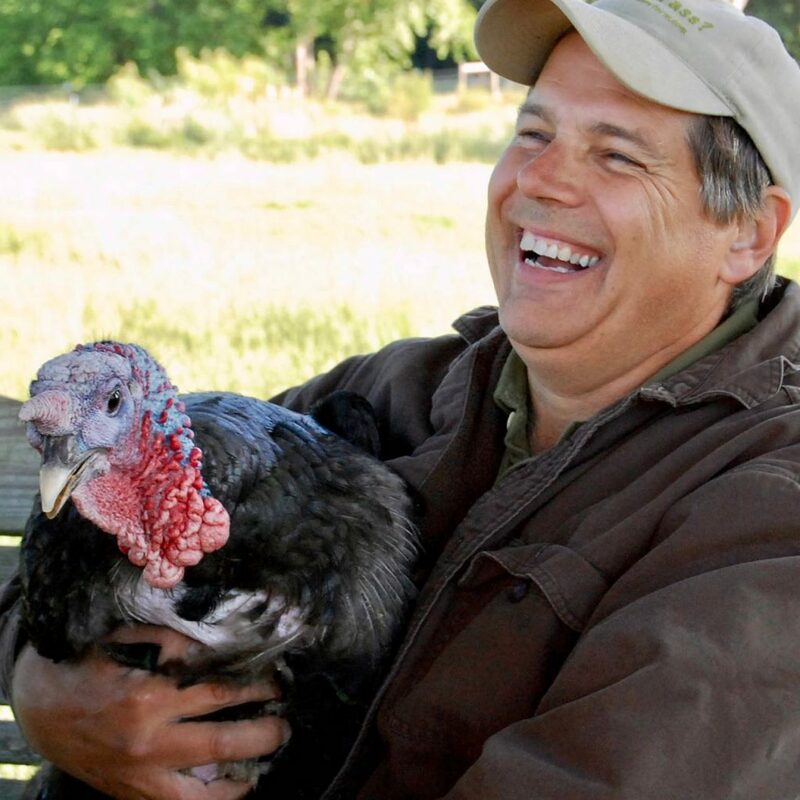 As you know, I’ve long been an advocate of farmers taking responsibility for their own farm marketing and building their own brands so they can maximize financial sustainability. And as much as I still advocate that, the truth is that Crowd Cow endeavors to address two real problems related to pasture-based farming. The fact is that it’s far more convenient to purchase industrially produced meat in a grocery store than pasture-based meat direct from a farmer. Crowd Cow’s business model ameliorates this by allowing consumers to purchase meat from a farm they can identify, with meat produced in a transparent fashion. There are many farmers who either aren’t willing or able to build markets for their value-added products. As a result, many of them produce pasture-based animals that they may sell at sale barns. These animals may then blend into indistinguishable products on supermarket shelves (or in fast-food joints). Crowd Cow is one way these farms can reach markets that they couldn’t otherwise. So, I found the discussion both interesting and fascinating. Not just from the aspect of advocating sustainable agriculture, but also as an interesting lesson in entrepreneurship. I think you’ll enjoy it as well. I’ve either designed or helped farmers create over two dozen Farm WordPress Sites in the past year alone. One of my first requests is to get their high quality farm images. And I get their images all right, but are they high quality? Rarely. Out of focus, back lit, shot from poor angles…those are the characteristics of most farm images I see. And it’s a shame, because agriculture is a such a visual calling. Potential customers form impressions of our farms based on the images they see and the words they read. Trust me on that, even if they don’t do it consciously, an immediate impression is formed when they see your website or social media posts. You want that impression to be positive and emotive. That’s why I recommend that farm owners invest in high quality, professional photography. If you have to pay five hundred bucks for it, so be it. It’s a great investment for your business and it will help you to build and protect your brand. If you can’t afford that (or just want to be hip), barter with a photographer. That’s what I did back in 2012, trading farmstead cheese and raw milk for a professional photo shoot. It was a deal that both parties loved. Brainstorm a shot list. You’ll likely create a list of specific shots including you with animals, weeding, making cheese or whatever. And you want those specific shots. But you also want lots of candid shots…those that show your life on the farm. You know, the ones of you hoisting heavy bags, moving equipment, your dirty hands and knees and so on. Make sure you tell the photographer you want those type of shots. Otherwise, all your shots will look staged. That’s not natural and it’s not what you want. What are your natural resources? What natural textures do you have on the farm that could serve as a background? These could include large stones, stone walls, bridges, trees, forest, ponds or streams. Let your photographer know about them so they can be used for selected shots. Who needs to be in the shot? This should include you and family members involved in the farm business. If you have farm helpers such as employees or apprentices, you may want to include them as well (with their permission). But it could also include delivery drivers or others. You’ll want to consider this when you create your shot list and make sure they’re available on your chosen day. Choose morning or evening for farm photography. This will help ensure you avoid the harsh light of midday sun. A few hours after dawn and a few hours before dusk is an amazing time for farm photography. Have a rain plan. Guess what? It rains sometimes on the farm. But, as we all know, the work doesn’t stop. So should you cancel your photo shoot if it rains? Sure, if it’s a gulley-washer. But if it’s simply overcast with light rain you can get some great shots without any harsh light. Just give thought to any shots on your list that would be negatively impacted by a sprinkle (or high wind). Yes, that’s a pile of manure. I can tell you flat out that we livestock farmers quickly become blind to manure piles and many other unsightly images. But they stand out to farm visitors and they certainly have no place in (most) farm photography. Your photographer will probably be good at pointing out unsightly background images, but this can really be a problem with the candid shots. Just be aware…and do your best. Also, one of those cows is peeing. Ah, livestock…they just don’t always cooperate with the shutter. And when taking pictures of your flock or herd, you’ll notice some members not behaving in a socially acceptable manner. Or you’ll collect eggs and, OMG, that hen pooped in the nest box! So you’ll need to plan time for these realities. You’ll also need lots of shots (we had over 700 in my 2012 shoot) so you can choose your final selections carefully. Customers are buying food or farm products, not animals. Are you selling a cow? Or are you selling grassfed beef? This is less of a problem for flower or vegetable farmers, where the product in the field closely resembles what will be in the kitchen. But that sheep over there looks nothing like a lamb chop. So, why not plan shots of your products being used in the kitchen. It’s a great time to plan a shot of your farm family enjoying the fruits of your labor around the dinner table. I’m sure you don’t think of yourself as selling a “product,” but you are. So be sure to photograph the actual product. Change your clothes. If you don’t want every farm picture of you to look like it was taken on the same day, have 2-3 different shirts, hats or jackets on hand. Change them as needed to create the impression these shots were taken over time rather than on the same day. Match images to your nurturing sequence. It’s best if you’re clear, in advance, about how you want to use farm imagery in your marketing. 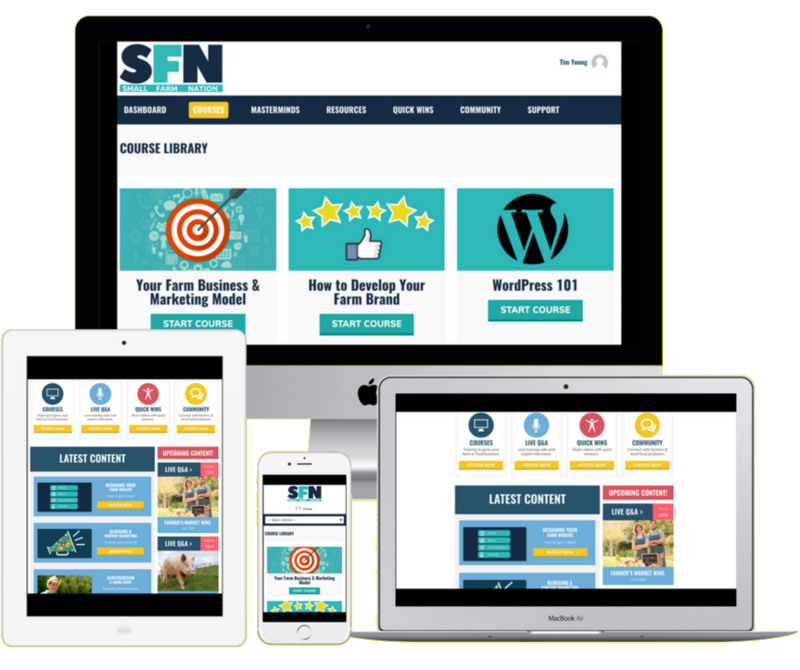 If you can outline your actual email marketing nurturing sequence in advance (I cover this in the Small Farm Nation Academy email marketing course), it will help you. For instance, when you get a new email subscriber, what farm image (s) will best help you to introduce yourself to your new friend? I’m guessing a shot of you, so plan one. But if your subsequent emails in the sequence are designed to get the subscriber to become a CSA subscriber, what shots can help in that regard? These could include everything from harvest and packing shots to delivery shots and even handing off to smiling customers (or someone who looks like a customer). The point? Think with the end in mind. Now…go schedule your own photo shoot. I enjoyed reading Andrew Zaleski’s article in Outside, titled,”What I Learned from a Month on the Carnivore Diet.” We’re only a few weeks into the new year so, of course, there’s all kind of discussion about diet, exercise and food choices. From Jillian Michaels keto feud with Al Roker to the Mediterranean Diet being hailed as the diet of the year. The all-meat Carnivore Diet isn’t new, and isn’t about to be named diet of the year. Not now, not ever. But, as a die-hard, Grade-A meat lover, it’s a diet I’m much more aligned with than, say, a vegan diet. And while I haven’t tried a full-blown carnivore diet myself, I did have a stint last year where I ate nothing but bacon. For two weeks. About two pounds of bacon a day. I’m not sure that I’ve ever been happier than I was then. read intriguing articles like this one, they jump off the juicing (or the intermittent fasting) bandwagon and onto the carnivore diet. Especially when they see those before/after images, like this one from Joe Andersen’s Instagram. 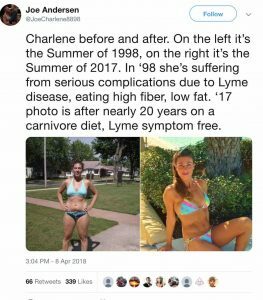 Joe and his wife, Charlene, were cited in the article, and have reportedly been on the carnivore diet since 1998. Yeah, 20 years of steak and eggs. I always fall back to what I refer to as the evolutionary diet. We didn’t evolve over the past 40 years. We evolved over the past tens of thousands of years. And we likely got here by eating whatever we could find, whenever we could find it. Implied in that is as much meat as we can get, seeds, tubers, nuts and definitely intermittent fasting. After all, there was no refrigeration, so we didn’t wake up to a bowl of Wheaties. Anyway, it’s a good read that you may enjoy. A Facebook review of Small Farm Nation: “Best money I ever spent. Tim’s knowledge and support are invaluable. I know this is just the business advantage that will set me apart from the competition! Thanks, Tim” – Pat Bury (Does my work help you? Leave your own review on Facebook here).